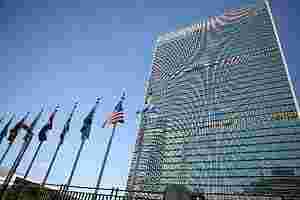 United Nations: The United Nations has warned that the world is on the brink of another recession, projecting that global economic growth will slow down further in 2012 and even emerging powerhouses like India and China, which led the recovery last time, will get bogged down. The UN ‘World Economic Situation and Prospects 2012´ report has cut the global growth forecast for next year to 2.6% from 4% in 2010. It has called 2012 a “make-or-break" year for the global economy, which will face a “muddle-through" scenario and continue to grow at a slow pace. “Following two years of anaemic and uneven recovery from the global financial crisis, the world economy is teetering on the brink of another major downturn," the UN report said, warning that “the risks for a double-dip recession have heightened". The report said the failure of policymakers, especially those in Europe and the United States, to address the jobs crisis, prevent sovereign debt distress and escalation of financial sector fragility poses the most acute risk for the global economy in 2012-2013. Growth in developing countries like India and China, which had stoked the engine of the world economy so far, will also slow down to 5.6% in 2012 from 7.5% in 2010. “Developing countries are expected to be further affected by the economic woes in developed countries through trade and financial channels," the report said. India’s economy is expected to expand by between 7.7% and 7.9% in 2012-2013, down from 9.0% in 2010. In China, growth slowed from 10.4% in 2010 to 9.3% in 2011 and is projected to slow further to below 9% in 2012-2013. Notably, the UN has revised its 2012 prediction downward for every major country. It projected 1.3% growth for the US (down 0.7% from its last forecast), 1.5% for Japan (down 1.3%), 0.5% for the 27-nation European Union (down 0.8%) and 8.7% for China (down 0.2%). A serious, renewed global downturn is looming because of persistent weaknesses in major developed economies on account of problems left unresolved in the aftermath of the recession of 2008-2009, it said. “Most developed country governments have indiscriminately switched from fiscal stimulus to premature austerity measures. This has further weakened global aggregate demand, already nurtured by persistent high unemployment," it said. Additionally, the economic woes in Europe and the US are exacerbating volatility in international financial and commodity markets and slowing growth in developing countries. “All of these weaknesses are present and reinforce each other, but a further worsening of one of them could set off a vicious circle leading to severe financial turmoil and a renewed global recession for 2012-2013," the report said. The report outlines several policy directions that could avoid a double-dip recession, including the optimal design of fiscal policies to stimulate more direct job creation and investment in infrastructure, energy efficiency and sustainable energy supply, stronger financial safety nets, better coordination between fiscal and monetary policies, as well as providing sufficient support to developing countries for addressing the fallout from the crisis.